Hiking is not just about fun and fabulous views, it is also great for burning calories. Here are four wonderful routes that will get your heart rate going. Trail hiking at the Hjørundfjord. If you want to get fit, plan a hiking holiday. On a hiking trip you work out for hours every day, often without even thinking about it. It boosts your general fitness and strengthens the large muscle groups in the thighs and buttocks. It’s also great for getting rid of those extra kilos. How many calories you burn depends on how fast you walk and how steep the route is. As a general guide, a woman of 65 kilos will burn 400–450 calories per hour when going uphill. Apart from giving you a good workout, hiking is also an activity that practically everyone can do. And best of all, hiking is a lot of fun and a great experience. When it comes to stunning views in accessible terrain, Norway is hard to beat. You can find walking trails for every ability, even though some of the most famous viewpoints are fairly challenging and require a decent fitness level. Here are four destinations with trails for everyone in decent shape, beginners as well as more experienced hikers. All routes are colour coded, so it’s easy to choose a suitable level – light, medium, challenging, or expert. You don’t have to be a mountaineer to enjoy the Norwegian mountains. There are numerous family-friendly walking excursions that are suitable for beginners. (The Pulpit Rock) is one of Norway’s biggest tourist attractions. It’s not hard to see why – this remarkable cliff is shaped like a giant pulpit that offers an astonishing view of the Lysefjord. There is a good hiking trail from Preikestolen Mountain Lodge to the top of the 604 metre high mountain plateau. Expect a total of four to five hours of hiking from the lodge to the top of Preikestolen and down again, depending on how long you stay at the plateau. The hike to Preikestolen is not too demanding, but the view from the top – and watching people standing close to the edge – is bound to get your adrenaline flowing. Read about how to be safe on your Pulpit Rock hike. For an extra challenge in the same area, a visit to Flørli is recommended. The 4,444 wooden steps to the top of Flørli is one of the longest wooden stairs in the world. It is a steep climb that takes around one and a half hour. (The Pulpit Rock) is one of Norway’s biggest tourist attractions. It’s not hard to see why – this remarkable cliff is shaped like a giant pulpit that offers an astonishing view of the Lysefjord. There is a good hiking trail from Preikestolen Mountain Lodge to the top of the 1,981 feet high mountain plateau. Expect a total of four to five hours of hiking from the lodge to the top of Preikestolen and down again, depending on how long you stay at the plateau. Romsdalseggen is located near Molde in the northern part of Fjord Norway. The hiking trails take you across the mountains overlooking fjords, mountain peaks, and waterfalls. You have three routes of varying difficulty to choose from, all of which start in Vengedalen. Spend the day walking across the mountain ridge and the evening relaxing in front of the fireplace. 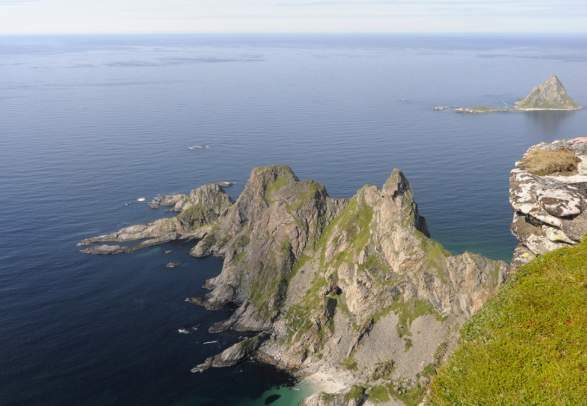 Hikes at Romsdalseggen take between six and nine hours depending on the route you choose. You are rewarded by open views of the Romsdalsfjord, the sea, and the mountain peaks Trollryggen and Romsdalshorn. Read about how to stay safe on your Romsdalseggen hike. NOK 150,- p.p. priority on bus if you book the ticket in advance. On a clear day, you can see one sixth of Norway from the top of Gaustatoppen, an easily accessible mountain in Telemark. From the parking at Stavro between Rjukan and Tuddal it takes around three hours to reach the summit and two to walk back down again, so you need around five hours in total. The height difference is 700 meters, and the hike is relatively easy. Close to the top, there is a mountain lodge where you can have a meal or spend the night – just remember to book in advance. in varied scenery, from lush hills and sandy beaches to jagged mountain peaks and wide open spaces. Thanks to the Gulf Stream, the climate is surprisingly mild. The temperature often climbs over 20 degrees Celsius in the summer, sometimes even over 30 degrees. Most destinations in Northern Norway have midnight sun in June and July. In the southern parts of Northern Norway, the sun may drop just below the horizon, but the nights are still remarkably light. 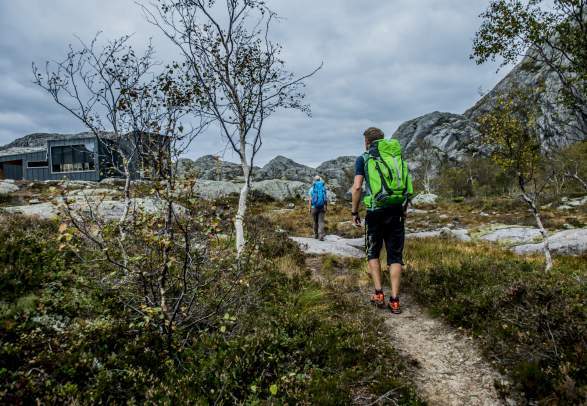 Try the iconic hiking trail Dronningruta, which is named after Norway’s Queen Sonja. She visited the Vesterålen Islands in 1994 and was captivated by the coastal landscapes with secluded beaches, charming villages, and dramatic cliffs with panoramic views. in varied scenery, from lush hills and sandy beaches to jagged mountain peaks and wide open spaces. Thanks to the Gulf Stream, the climate is surprisingly mild. The temperature often climbs over 70 degrees Fahrenheit in the summer, sometimes even over 85 degrees. Outdoor trainer Lasse Tufte seeks areas of fresh air, fantastic views. rewarding activities, and not too many people. An extensive network of hiking cabins allows you to discover more of Norway on your holiday. Hike from cabin to cabin along the coast, in the forests and in the mountains. It is wise to consult the experts when planning a hiking trip. Discover Norway has tour suggestions and packages for every taste and level. With good footwear and some food in your backpack, you can head for a tranquil area where all you hear is your own heartbeat. These are Norway’s peaceful green lungs. Small-scale hiking advocate Torbjørn Ekelund suggests five day trips for friends and families who want to go easy and take their time. Pack your bags, and remember your map and compass. Just outside of Røros awaits 6,000 square kilometres of wilderness, filled with centuries of Norwegian history. There is no reason to wait until you’re here to find out where you can hike. Filter your search and check out the offers below. Cycling in Norway equals gentle rides through quaint villages and magnificent nature – but also tough mountain biking trails and big events like the Arctic Race. Cruise ships are fun, but if you really want to get up close and personal with the still and deep Norwegian fjords or the wilder coastline, kayaks or canoes are more intimate options.